The Saturn V Rocket and the Bombardier Beetle « Why Should I Believe? Why Should You Believe? At our last San Antonio Bible Based Science Association meeting, while watching President Scott Lane discuss the bombardier beetle, my mind flashed back to the documentary “Moon Machines 1 – Saturn V Rocket.”1 The Saturn V rocket was perhaps the most awesome machine ever built by man. The Soviets had the N-1 Rocket.2 But it did not prove to be the reliable rocket that the Saturn V was. Like the Saturn V rocket, the bombardier beetle has two fuel components – hydrogen peroxide and hydroquinone. The Darwinists have made much of the fact that these components do not actually explode when brought together.3 Then they tell a nice story about how this beetle could have evolved – something that Darwinists are very good at. But that actually just presents another problem. Not one, but two catalysts – peroxidise and catalase – have to be added to produce the explosive reaction. This happens in the combustion chamber. 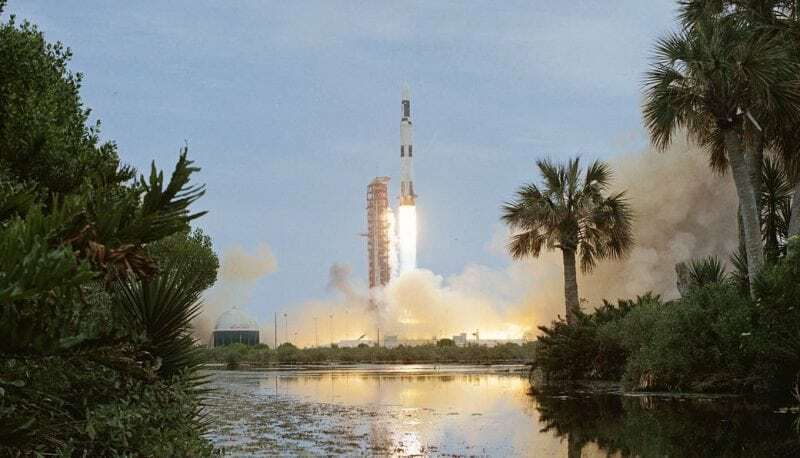 The hydrogen peroxide/hydroquinone mixture does have to be kept separate from the catalysts until time for use.4 This is similar to the Saturn V which needed an igniter once the two fuel components were brought together. This was actually something that failed on one of the test launches. When the igniter failed, one of the J-2 engines of the second stage shut down. Again, the team examined the problem. They determined it was a problem with the fuel line to the igniter and decided on a different material for the line. Cross wiring caused another J-2 engine to shut down and they came up with a fix to ensure that did not happen again. Note that when something was not working correctly on the Saturn V rocket or any of the other rockets, teams of engineers, scientists and technicians would painstakingly sift through all of the data, and the expended rocket or the wreckage of the rocket, to determine the cause. Then they would go to work on a solution. Now imagine these teams of scientists, engineers and technicians using the Darwinian model to design the Saturn V and come up with solutions to the rocket not performing. Imagine them – without even trying to figure out what went wrong – just randomly trying different things until the rocket worked. What is going to happen? They will never get there! How many components and systems that are working are they going to break before they stumble upon a fix for what is not working? Imagine starting out with the instructions to make a bottle rocket, and without putting any thought whatsoever into it, just randomly changing the instructions for building this bottle rocket.5 When a change makes the rocket completely fail, any changes associated with that failure get eliminated. When the rocket does not fail; but there is no improvement in rocket performance, or there is even a drop in performance, you are stuck with these changes in instructions that did not make the rocket better (like genetic load building up from mutations). You just continue making additional random changes, hoping for the best. Are you ever going to end up with the instructions to make a Saturn V rocket? Keep in mind you do not have any idea what a Saturn V rocket is or where you are going with any of this. You are just trying to see if the next bottle rocket worked better than the last bottle rocket – or maybe just worked better in a particular environment. But that is exactly how the Darwinists are saying that this bombardier beetle was created. Through genetic mutations (random changes in the instructions for making this beetle), natural selection (Oh, this change did not work.) and the magic wand of time; the combustion chamber, the glands to make the fuel components including the catalysts, the valve that separates the fuel reservoir from the combustion chamber and opens when needed, the muscles that squeeze the fuel contents into the chamber, the plumbing involved, and the ability to control the expelling of this noxious mixture were all formed and all came together. We have not even talked about how we got a beetle to start with. It took teams of engineers, scientists, technicians, craftsmen and specialists (to include surfers) to not only design; but overcome all of the problems in building the Saturn V rocket; and then to make it all come together. It was such an enormous undertaking that different companies built different sections of the rocket. We have not even gotten into the logistics of getting all of these components together to make one rocket. https://www.youtube.com/watch?v=o39UlJlMce8 — Moon Machines 1 – Saturn V Rocket – Stage 2 begins at 14:00. Hi Terry, I know there is no need for you to do this, specially with your book having such accessible price tag. But I am an undergraduate student on Environmental Studies, and right now I am about to start a research about controversies, like global warming, for instance. A lot of people don’t believe it, and I think I can relate to your book when it says “he became frustrated. The reason Terry had so much consternation was the unexpected source of the frustration church leadership. Church leadership was actually afraid to share this message that people really can believe the Bible! This book documents Terrys struggles and tells what you can do”. I want to know what you’ve done, although it is not the same topic, it deals with the same problems. Did you get the pdf that I sent?